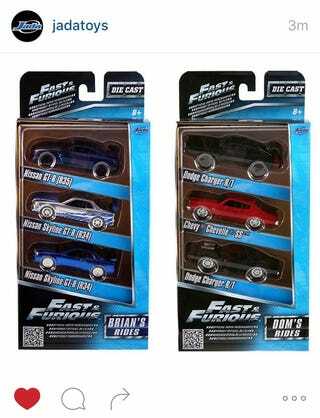 Jada posted two new 1/55 three-packs on their Instagram today; one with Brian’s Skylines and other with Dom’s Detroit muscle. Jada also posted three new 1/18’s including the Lykan HyperSport that I know a few LaLDers we’re excited about. I’d be picking up Dom’s Buick if I didn’t have my GMP already. These should be in stores sometime this month. Lastly they posted two Supras stating these would be available early this month.